This game is a classic helicopter game. 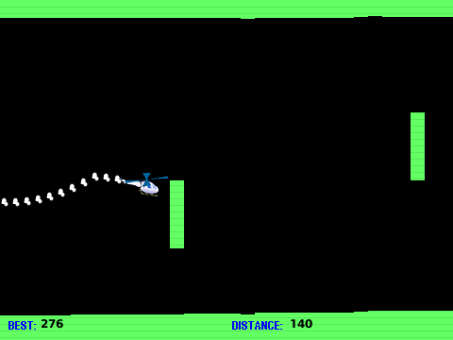 Guide the helicopter through the cave and avoid the obstacles. Press any non-control key and hold it (non-touch screen devices) or touch the screen and hold (touchscreen devices) and the helicopter will accelerate upward. Release the key (non-touch screen devices) or take your finger off the screen (touchscreen devices) and the helicopter will fall with gravity.